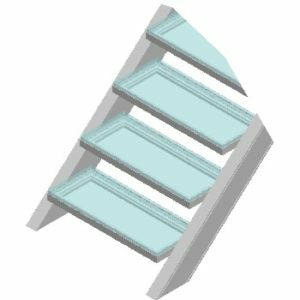 stairplane™ staircases are the result of 25 years of research and development, manufacturing experience using anodised aluminum and experience with building regulations all over the globe. The unique composition in the aluminum allows us to achieve strengths equal to steel, but with a fraction of the weight, making installation much easier. Aluminum also is a more refined metal than steel and does not give a dated look with time as most steel staircases. Some of the staircases you see on this site were designed over 20 years ago, and still have a discrete, modern aesthetic. You can find stairplane staircases in every European country, as well as in the US. We have technical solutions for practically every architectural wish and challenge, ask us. Our classic stairplane™ stringers are massive 10 mm brushed, anodised aluminium. This stringer is available in several heights which we optimise to achieve the most mimimal aesthetic and strength. The stringers can be natural anodised, color anodized or powder coated. These stringers weigh half of comparable steel stringers and have the same strength. All the bolts can be hidden. ENHANCED stairplane® stringers are manufactured using massive 65 mm anodised aluminium. 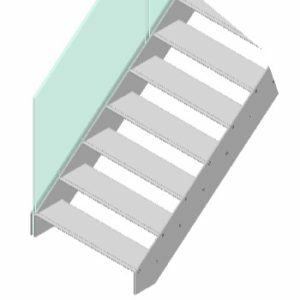 This stringer allows us to create staircases with protruding steps, making the staircase appear more free-floating. There are no visible bolts. The unique width of this stringer also optimises the space needed for handrails. We offer 4 step shapes, and multiple colors and materials. The WING step is an anodised wing-shaped step, like on an airplane. The step has a recessed black rubber insert to prevent slipping. This is the step shown on our homepage. It is absolutely cost-effective and is our best seller. 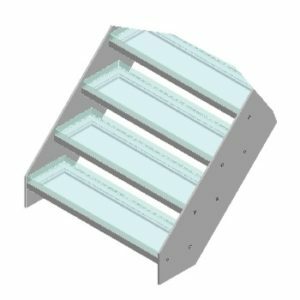 The TRIANGEL step is an anodised aluminum step, with repeating ridges which create a very robust anti-skid surface. This step is often chosen for high-traffic areas or by families with children. The SLAB step is our most customisable. It is manufactured using a very strong anodised alumuminum frame, and can have inserts of any color glass, natural stone, concrete, wood or aluminum slabs. It is also available ‘naked’ and you can insert your own material. This step is available in any color. The SLAB also comes in an XL version for extra-wide staircases with extra-thick steps. The XL step is meant for public buildings, restaurants, offices, etc. where a very wide step is needed. The profile is extremely strong and can be made up to 70” in staircase width, without any steel. The step is almost 12” deep. Most of our staircases can be manufactured with open or closed risers. All our glass, stone and wood versions fulfill US Building Regulations as long as your risers are 7 inches or less. If your risers are larger than 7 inches, we also have solutions to fulfill US Building Regulations. Ask us for more details. We offer two times of code-compliant, sleek and minimal design railings for our staircases, landings, walkways and horizontal railings. 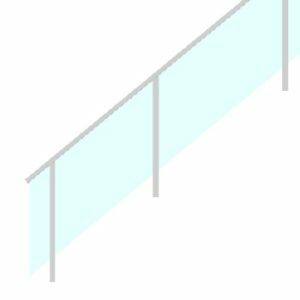 The framed glass railing is a minimal aluminum framed railing with a 9 mm safety glass, available in any color. The aluminum is natural anodised and is timeless. We can also color the railing in any RAL color you wish. The full glass railings are just that, full glass, with no visible profiles. The glass is 21 mm, structural, safety glass, which can be manufactured in any color. We also manufacture handrails in anodized aluminum and stainless steel. Some of our handrails can be illuminated from the bottom. We can recommend excellent installers for our staircases in New York. One flight of staircase generally takes approx. one day to install, depending on access and size. Each staircase is made-to-measure in our factory, assembled to make sure every milling and every bolt works, then carefully disassembled and packed for transport. Our stairs are high-value objects, and are generally installed in the later part of the construction phase when the final finishings in kitchen and bath are taking place. Stairplane staircases are not anchored into the floor like traditional steel staircases, they are only fixed to the slab behind the upper step at the top. This fixation takes place in either a wood or steel beam or concrete. 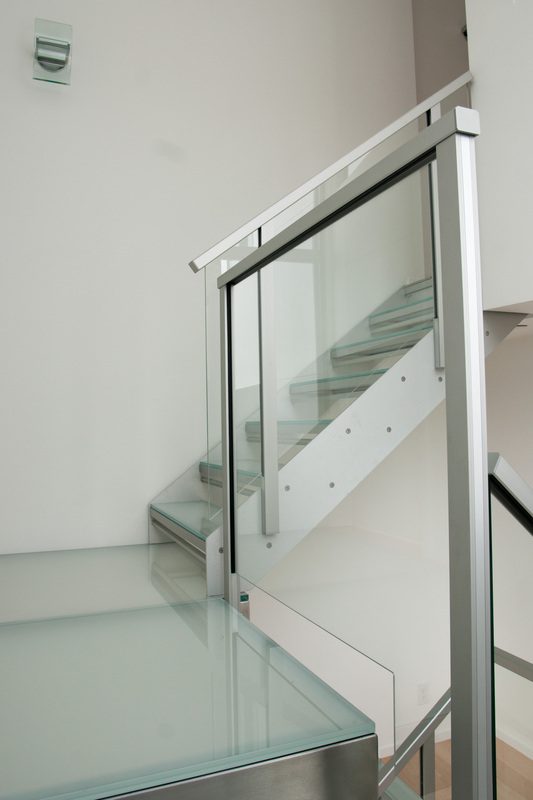 All our glass railings meet building codes. Some of our step solutions come in XL versions, which are extra thick and could meet the 4″ rule, others can be made code-compliant be adding our ‘safety’ bars placed high and discrete under each step. You can see how the safety bars look here. To determine what is best, send us your plans and your wishes. We have other solutions for meeting the 4″ code.